Herb and his wife Gladys owned a tourist camp at Lake Temagami in the early 1940's. He served as a fishing guide to his patrons. Herb was a licenced mechanic who originally worked on automobiles but later opened a farm machinery business and repaired farm machinery - in the back shop as shown and often out in the farmer's field. Herb owned the gas station on highway 17, Cobden where Mary Ann's Fashions are currently located. Here he is photographed in front of the business with his brother Stewart Francis and long time friends Campbell Brisco of Northcote and Frank Findlay of New Liskeard about 1945. Herb sold Oliver farm machinery. Here he is photographed at his cousin Ellsworth Francis' farm at Northcote with Ellsworth. Herb Francis (President of Cobden Curling Club) throwing the first stone at the opening of the Cobden Curling Club in 1961. Ladies President, Eileen Truelove, looking on. Posthumous Award: Royal Caledonian Curling Club President Maurice Robert presented Gladys Francis, Fay Bennett and Ken Francis with a life membership for their late husband and father, Herb Francis. Mr. Francis, the initial present, ice maker and avid curler passed away last summer. Herb Francis represented Cobden. Is 5th from Left in 2nd row. Photographed by Montaigne in Pembroke. CHx-Francis, Herb playing fiddle with the Kohlsmith boys Cobden July Fest in the Memorial Hall parking lot. July 9, 1983. The day my dad died...He finished his set and sat down with my mom and passed away. Doing what he loved to do. front table: Art & Cora McInerney, Clayton Valliant & ? Obituary of Herb Francis published in the Cobden Sun, paper date July 13, 1983. [S450] Family Stories of Herb Francis, Fay Bennett. 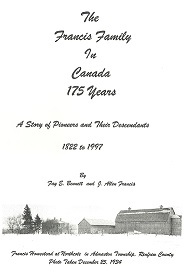 [S2] "Ontario Birth Registrations online at Ancestry.com", FamilyTree.Com, (Name: Subscription www.ancestry.ca;), 044730 Wilberforce & North Algoma Twp. Renfrew Co., ONtario (Reliability: 3).